Fark featured a discussion on the 10 most ridiculous costumes in comic books. Someone posted a picture of the Rainbow Raider, a nemesis of the Flash. The Rainbow Raider's costume looked somewhat familiar. 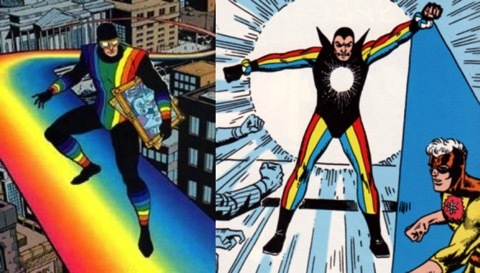 Compare the costume of the Raider, who first appeared in 1980, with the costume of Dr. Spectro, an opponent of Captain Atom, who first appeared 14 years earlier in 1966.